All About Moorea, "Tahiti's Magical Isle"
It's just a 10-minute flight or a 30-minute ride by high-speed catamaran from the international gateway at Papeete on Tahiti, but its striking, spire-topped landscape and meandering, underdeveloped shoreline lined with simple villages make it feel miles removed from modern civilization. That's not to say it lacks infrastructure - far from it. Moorea is home to an impressive selection of world-class resorts, a wide range of sights and activities and some of the most easily accessible adventure in Tahiti. This means it is equally ideal for couples on a romantic getaway/honeymoon or families seeking ease and convenience. Plus, its accessible location translates into room rates that are a bit easier on the wallet than on some of Tahiti's more far-flung islands. A few things truly set Moorea, known as "the Magical Island," apart: It has lovely beaches, Tahiti's only golf course and a vast and incredibly lush interior, including the Opunohu Valley filled with every tropical plant and fruit imaginable. 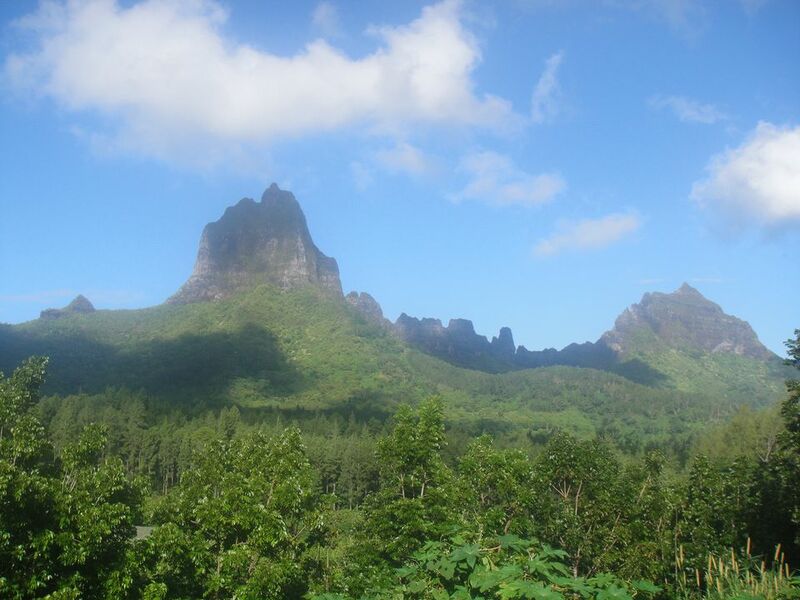 With its eight mountain ridges, Moorea also boasts some of the most stunning panoramas in the South Pacific, enjoyed from viewpoints reached either by rental car, 4X4 tour or your own two feet. While overshadowed by the world-renowned lagoon of its more famous sibling, Bora Bora, Moorea's waters teem with life. Some of its more popular and memorable activities involve getting up-close and personal with sharks, stingrays and dolphins. Plus, the island's twin bays are not only geographic markers, but also gathering spots for the cruise ships and pleasure boaters that congregate to enjoy Moorea's many natural splendors. At 80 square miles, Moorea is part of Tahiti's frequently visited Society Islands and is home to about 16,000 people. It is located just 10 nautical miles from the main island of Tahiti. The small airport on Moorea is located on the northeast coast and is served by Air Tahiti and Air Moorea flights from Tahiti's Faa'a International Aiport. Flights take 10 minutes and depart about every half hour. It is also possible to fly from Moorea on Air Tahiti to Bora Bora, Huahine and Raiatea. Transportation to and around Moorea is quite easy. A more affordable alternative to flying, high-speed ferries make the trip from the wharf in Papeete's waterfront to the passenger dock on Moorea at Vaiare six times daily and take about 30 minutes. Upon arrival, most resorts provide transportation from the airport or the passenger dock at Vaiare (arrange this in advance with your hotel or tour company). Taxis are available and the public transport service, known as Le Truck, operates between the ferry dock and the island's main villages along its circle-island road. Rentals cars are available for hire, as are helicopters for sightseeing excursions. A variety of tourism companies operate 4X4 trips into the mountainous interior. It is also possible to sightsee by water via motorboat tours or outrigger canoe (which can be arranged by your resort, tour company or cruise ship). Moorea has no urban center, but rather the island is home to a series of small villages, such as Paopao and Haapiti, that line it shores. It is easy to visit them during a circle-island self-drive or tour, stopping off to taste many "made in Moorea" products, such as pineapple- and coconut-flavored rums and liqueurs, mango and passion fruit jams and other farm-fresh agricultural bounty. Moorea is not an exceptionally large island, but its heart shape is endearingly unique and its topography is among the most memorable in Tahiti. Its interior is a patchwork of bright green valleys stuffed with working plantations and pineapple fields - all surrounded by eight sweeping mountain ridges. Its iconic viewpoint at Belvedere Overlook is a must. Stand here to enjoy sweeping views of Moorea's two massive side-by-side bays, Cook's Bay and Opunohu Bay, which dominate the island's north shore. Reachable via 4X4 drives or hikes, Moorea also has several interior waterfalls located deep within its green and scenic valleys. Shops are generally open weekdays from 7:30 a.m. to 5:30 p.m., with long lunch breaks taken at midday, and until around noon on Saturdays. The only shops open on Sunday are located in hotels and resorts. There is no sales tax. Donna Heiderstadt is a New York City–based freelance travel writer and editor who has spent her life pursuing her two main passions: writing and exploring the world.